When the sun lowered in the sky and twilight cast its darkening shadows across the land, the elves come out to play. Indigo and his brother, Alfonzo, lived inside a tulip. During the day, when the sun shone down on the meadow, they stayed inside the flower, huddled into a ball and slept, using the petals for a blanket. But when the sun went down, the elves sprung from the tulip and flew around the meadow. Whenever Indigo and Alfonzo flew, lime green and bright pink sparkles popped around them. Often they would have competitions with the fireflies and glow worms. By the light of the moon, the two elves tied cow's tails into knots, twisted pig's ears and pulled clumps of wool from the sheep's back. They were mischievous elves. One evening, as the elves were hiding in a ring of mushrooms, a small girl dropped a jar on top of them, capturing both inside. She scooped them up and put a lid on. "I've got some fireflies, Mummy. I've got two big ones." The little girl ran to show her mum. "Lucy, those are strange looking fireflies. It almost looks like they are wearing clothes," her mum said. "Mummy! Don't be so silly. I'm going to take them home and put the jar on my drawers and watch them until I fall asleep." She skipped home with her mum. Indigo and Alfonzo flew around inside the jar, trying to escape. After a few minutes they were exhausted and sat in the middle of the jar trying to decide what they should do next. As the girl ran the two elves bounced up and down and hit the sides of the jar until they were bruised. A sigh of relief escaped their tiny mouths when the girl put the jar on her drawers and turned off her light. They stayed in the jar all night long, staring out at the moonlight and wishing they were free. When morning came around the bright sun replaced the moon. "Lucy, I think you should let those fireflies go. They don't look like they are feeling well." "But, Mummy, I like them." Lucy looked at the elves. "They don't look very happy. I'll let them go." Lucy carried the jar outside and dumped the two elves on the grass. "There you go, little fireflies. Fly away." Indigo and Alfonzo flew off into the tree. "You know what, Indigo? I think the sun feels nice and warm. I say we stay out here for an hour or two and enjoy it." 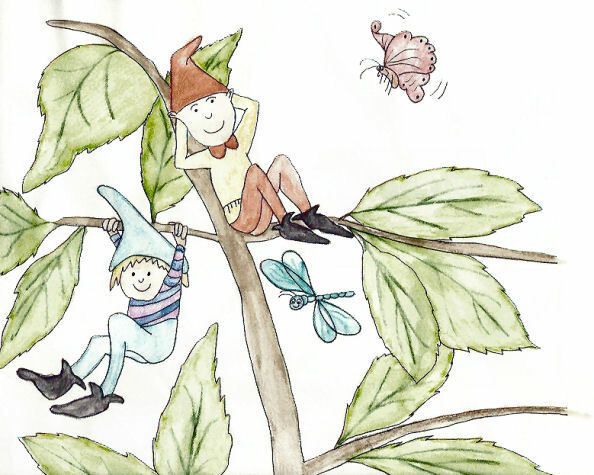 The two elves sat on the branch of an oak tree. Indigo swung back and forth among the butterflies and dragonflies as Alfonzo took a morning nap. After the sun rose higher in the sky it became too warm for them, so they flew down to the tulip and fell asleep. As evening appeared and they woke up, they were careful to stay away from little girls named Lucy.